VOSA have announced that all MoT stations are required to have an approved trailer socket tester and compliant leak detection spray. The BTT-111 is our new VOSA approved, UK manufactured MoT trailer and caravan socket tester and is currently supplied with a free leak detection spray and 5 year warranty. The socket tester is used to check the 13-pin electrical towing sockets that are fitted to vehicles with tow-bars. If the sockets are faulty, then secondary lights fitted to the trailer or caravan may not work correctly. 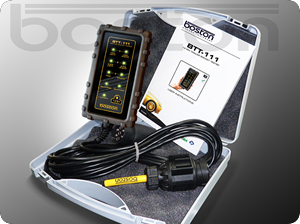 BTT-111 checks the output from each pin on the socket and determines its operation. 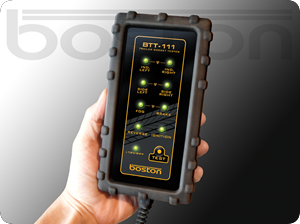 With the majority of caravans and trailers still using conventional 7-pin sockets, BTT-111 is supplied as standard with an adapter plug to ensure complete coverage of the market. Featuring a membrane keypad with integrated LED indicators to signify correct output when the vehicle controls are operated, and a TEST button is also included in order to illuminate the LEDs and check the tool is operating correctly prior to testing the vehicle. The BTT-111 MoT socket test tool is fitted with an internal battery enabling the TEST feature to operate without the presence of power (not available from 7-pin sockets). When using the TEST feature on a 13-pin socket, the battery is automatically bypassed and power is taken directly from the vehicle, thus increasing battery life. BTT-111 socket tester is designed and manufactured here in the UK with reliability in mind. Fitted with a protective ruggedised cover for extra durability and supplied complete with a 5 year warranty, the BTT-111 is the market leader. Robust, reliable and built to last… Avoid the last minute rush, order online today and receive a free leak detection spray.